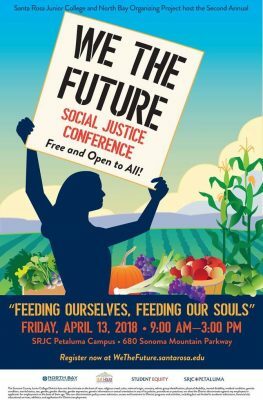 Santa Rosa Junior College and North Bay Organizing Project (NBOP) invite proposals for workshops, presentations, panels, and performances for our second-annual We the Future Social Justice Conference, which will be held at SRJC Petaluma on Friday April 13, 2018 from 9am to 3pm and is FREE AND OPEN TO ALL. You can submit a proposal here: https://wethefuture.santarosa.edu/call-proposals. Last year’s inaugural conference attracted nearly 400 participants and drew people together from all walks of life, from college and high-school students to longtime local activists representing varied groups including Graton Day Labor Center, LGBTQ Connection, Community Action Coalition, Homeless Action! and the Police Brutality Coalition of Sonoma County. We encourage proposals that address this year’s theme: “Feeding Ourselves, Feeding Our Souls.” This year’s topic reflects both the issues of social justice in the realm of food, as well as the urgent concern with healing, nourishing, and building healthy communities in the aftermath of the devastating North Bay fires. Proposals for workshops that are hands-on and interactive, and that address the connection between social justice, personal and community wellbeing, and equitable access to resources will be prioritized. In keeping with this theme, our keynote speaker will be Nikki Silvestri, a thought leader on issues of food justice and sustainability who was named one of the 100 Most Influential African Americans by The Root magazine. We hope to see you at the conference! You can also register to attend, table at our Resource Fair, or volunteer at wethefuture.santarosa.edu. Those who register will enjoy free lunch and live music at noon by SLV, the new critically-acclaimed project of Sandra Lilia Velasquez, formerly of alt-Latin group Pistolera, who performs soulful Chicana protest songs that mix pop, electronic, hip-hop, and world genres comparable to Sade, Santigold, Ana Tijoux, and Little Dragon.